Make fresh tracks through prehistory with a day of exciting activities and surprises for the whole family. Ride behind a locomotive and follow the dinosaur tracks around the Museum’s 15-acre railyard and enjoy dinosaur themed activities hosted by Denver Museum of Nature & Science, Dinosaur Ridge and Morrison Natural History Museum. Check out an epic LEGO Layout created by DENLUG and build your own dino creations. Usborne Books will host Story Time in the Library. 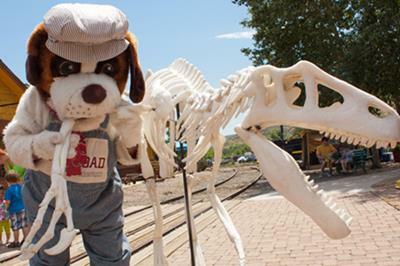 Enjoy tasty food and meet our famous Spike the Railroad Dog and Mr Bones. Admission: Museum members and Children under 2 are free, Children $5, Adults $15 and Seniors $10. Admission includes unlimited train rides as well as entertainment throughout the grounds. We will be open to the public from 9AM-5PM with entertainment and events running 10AM-4PM.